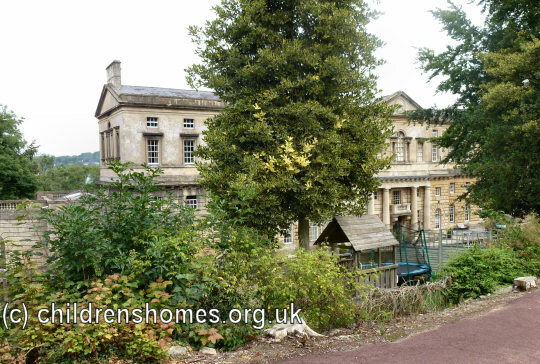 In 1917, the Industrial School for Roman Catholic Boys, formerly based at Cannington, relocated to new premises at Prior Park, near Bath. The property, a huge eighteenth century mansion built by Ralph Allen, the renowned architect of Georgian Bath, had previously been used as a Roman Catholic training college. At the start of the First World War, the site had been taken over for several years for military purposes. 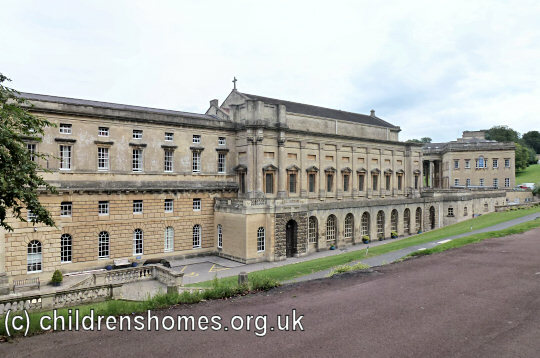 In January 1917, Prior Park School, as it now became, was certified for the accommodation of up t0 150 boys, aged from 9 to 10 years at their date of admission. The School's superintendent at Cannington, Mr George L. Harding, continued in the post at Prior Park. In August, 1919, a 13-year-old London inmate of the School, Frederick Green, was found by a policeman at 3 a.m. limping along a Bath street with a dog chain attached to his right foot. The boy said that he had been chained up at the school and then beaten on the head by a master with a rolling pin. He had got through the window, measuring only 14 inches by 11 inches, of the top room which he was confined, and then slid down a water pipe. In response to police enquiries, the superintendent of the school stated that Green was incorrigible, and had made many attempts to escape. At a subsequent court hearing, four masters of the School were charged assaulting and ill-treating Green. All pleaded not guilty. Green testified that he had arrived at Prior Park from the llford Industrial School on July 24, and, alleging that he had tried to escape, the superintendent, Mr Harding, punched him on the jaw and had his head shaved. The following day he ran away, but was captured at Hungerford, and Henry White, the School's manual instructor, had put chains on his bare ankles, in which condition he passed the night. The next morning, one of the boys chained him to a table in the kitchen, and Mr Harding struck him several times with a rolling-pin. Green had said "Sorry, sir," and Harding had belaboured him again. Green said that he had remained in chains for the next two days, and in the evening they were taken off and his cut ankles dressed with iodine. When Green told Harding that he wished to go to sea, Harding had hit him on head, ribs, and leg, and, being chained to the table, Green could not dodge him. Other boys testified as to seeing Green in chains, and a boy called Philpott stated that Harding had struck Green several times with his fist. Two others admitted they had struck Green while he was chained up. Dr J.M. Harper, a police surgeon, said there were three very recent scars on Green's head. He had a cut lip, contusions over the shoulders, ribs, back, left thigh, chest and arms, and there were deep lacerated sores over the wrists and left instep. There were also marks on the head caused by a blunt instrument. Harding said that he and his three subordinates had sole charge of 120 boys. He was quite unaware that Green had been chained up, and he had been at Weston-super-Mare when it took place. He admitted hitting the boy twice, but never with a rolling-pin. Harding said that the school had an inadequate staff, Chaining was, of course, unauthorised, but there was no cell provided for absconders. Gaston Renard, gardener, Charles Rosenthal, master tailor, and Henry White, manual instructor, were also stated by Green have ill-treated him. Rosenthal had manacled him. passing chains from his ankles up his back to his wrists, which were held behind him. At night, his legs were bent double and secured up behind him, so had to spend the night his back. He was later chained to the hot-water pipes. On falling out of bed he could not get back. One night the boys beat him with belts while he was helpless, and his face was covered with blood. Rosenthal denied striking the boy, although on finding he had broken one chain, he had bound him with another, despite having no authority for doing so. Henry White also denied ill-treatment, as did Renard, an ex-private in the Belgian army, who had been wounded in action. Harding was found guilty and fined £10 plus costs. Renard was found not guilty, White was fined £2, and Rosenthal, whose conduct was described by the bench as extremely cruel, was sentenced to a month's imprisonment. The magistrates strongly criticised the School's Management Committee for neglect. Following the 'chained boy' case, a change of management was inevitable. In 1920, the running of the School was taken over by the Irish Christian Brothers who had been based at the site from 1895 up until the start of the First World War. The Rev. Brother G.S. Roche was appointed superintendent. A report on the School in 1920 noted that the boys each had three outfits: a tweed suit, a blue serge suit, and corduroy knickerbockers with a tweed jacket. The also wore monogrammed cricket caps and had clean starched collars, thanks to the large steam laundry on the premises. 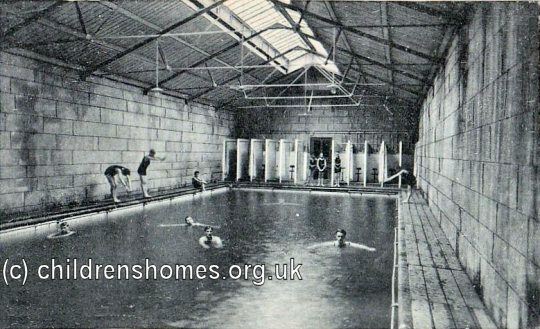 Most of the boys went home at holiday times, with three weeks being allowed in the summer. The boys played football matches with other sides in the area including the Nautical School at Portishead and the Bath Ladies' Football Club. In January, 1923, the School again received widespread publicity when a 12-year-old inmate named Percy Chilwell was arrested after placing some wooden fencing posts on a railway line in the path of the Cardiff to Brighton express, thus endangering the safety of passengers. Fortunately, the train had stopped in time to prevent a serious accident. Chilwell, who had absconded from the School several times, was later sentenced by magistrates to be committed to a reformatory until the age of 18. In a report of the court proceedings, it was noted that the boy heard this portion of his sentence with a pleased smile, apparently regarding it as the fulfilment of his wishes. When, however, learned that was to receive six strokes the birch rod, his radiant mood speedily changed. He gave an audible gasp of apprehension, and before he was removed from the Court had given way to unrestrained tears. The establishment resigned its Industrial School certificate in April, 1924, but continued in operation as a school for Roman Catholic boys, receiving scholars transferred from St Brendan's College at Bristol. The site, known for a time as St Paul's College, is now home to Prior Park College, a co-educational Catholic boarding and day school.